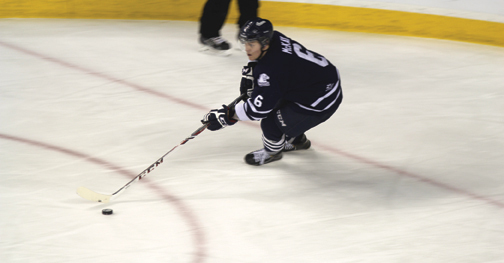 The Mount Royal Cougars men’s hockey team defeated the University of Calgary Dinos at the Scotiabank Saddledome on Feb. 7 in the second annual Crowchild Classic by a score of 4-3. Chris Collins (2) and Walter Wintoneak tallied for the Dinos, while Devin Gannon (2), Matthew Brown (1) and Cody Cartier (1) lit the lamp for the Cougs. A sea of red and blue filled the stands of the Saddledome as the game set a Canadian Interuniversity Sport (CIS) regular season attendance record, with 6,016 spectators passing through the gates. You could feel the new sense of unity amongst Mount Royal fans, alumni and staff. There was a lot on the line for the Cougars besides repeating last year’s success. Any two points this time of year are crucial, especially for the Cougars, as the UBC Thunderbirds were only two points behind Mount Royal heading into the game for the final playoff spot. The first period was a fast paced, hard hitting affair with solid scoring chances at both ends. The Cougars were the first to cash in on an opportunity at the 15:53 mark of the first. Gannon sent a sweet feed to Brown, and he buried his 10th goal of the season. The Dinos were quick to respond when, less than a minute later, forward Wintoneak fired a quick wrister from the slot and beat Mount Royal’s Dalyn Flette low glove side. The Cougars quickly rebounded thanks to a one-man effort from Devin Gannon, who out-skated Dinos D-man Cory Pritz, stripped goaltender Kris Lazaruk, and easily buried the wrap-around. Gannon was also instrumental in the Cougars third goal setting up Cody Cartier for his 13th of the season. 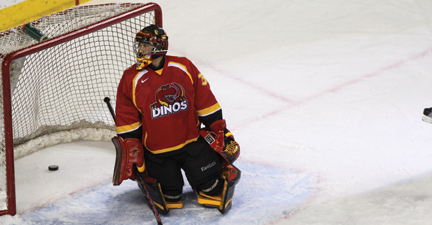 After replacing goaltender Lazaruk with Jacob De Serres for the start of the second period, the Dinos regained their composure and the Cougars were content to play conservatively and hold on to their lead. The second period had few scoring chances for either team. The conservative play continued for the majority of the third until Cody Cartier was sent to the box for tripping and Dinos forward Chris Collins cashed in on the ensuing power-play — pulling the Dinos within one, which ignited the U of C faithful. With the Dinos buzzing, the Cougars were able to stay the course until the seven second mark when Chris Collins set up Taylor Stefishen for the tying goal. It was off to overtime. As fast as Dinos fans were up, they were sat back down when Kevin King took an undisciplined and rare overtime penalty in his own end, crosschecking Matthew Brown, setting up a four-on-three scenario. On the power play, the old hockey adage “just put it on the net and anything can happen” reigned true as Matthew Brown threw it on net and the puck deflected off Devin Gannon beating the Dinos’ goalie for the win. The Mount Royal fans in the building erupted, and sent out the Cougars with a chorus of “M-R-U” chants. The win seemed to unify Mount Royal’s fans. The marketing, prizes, swag, transportation to and from the game and the entire experience was a complete success for the Cougars athletic department.